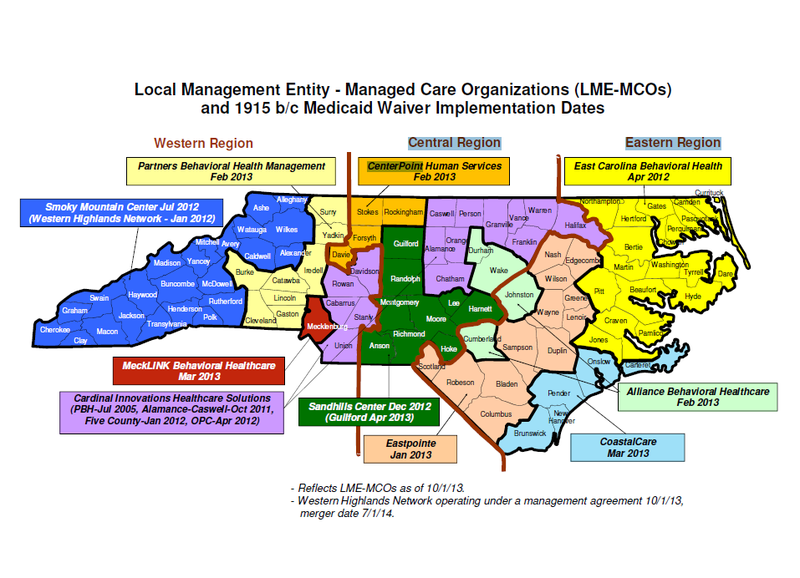 NC Medicaid: Waiver v. Non -Waiver Services – What’s the Difference? There is a 4.9 year waiting list to receive a spot on the Innovations Waiver. The waiting list is unhelpful when you have a child or adult with severe developmental disabilities who needs Waiver services NOW. What services are available for the disabled who qualify for Waiver services, but have not received a spot on the Innovations Waiver yet? For children (up to age 20), the alternative to the Innovations Waivers is the Community Alternatives Program for Children (CAP/C) 1915(c) Home and Community-Based Services (HCBS) waiver was approved by the Centers for Medicare & Medicaid Services (CMS). The waiver took effect March 1, 2017. Each day of institutional respite counts as 24 hours towards the annual limit. Pediatric Nurse Aide Type, frequency, tasks and number of hours per day are authorized by the case management entity based on medical necessity. In-Home Aide Type, frequency, tasks and number of hours per day are authorized by the case management entity based on medical necessity. Financial Management Service Consumer-directed initiation fee must be assessed the first month of enrollment and shall not exceed 4 units (1 hour). Monthly management fees shall be assessed each month and shall not exceed 4 units (1 hour) per month. (Appendix B) Financial Support Services are available and provider directed. Assistive Technology Included in a combined home and vehicle modification budget of $28,000 per beneficiary per the cycle of the CAP, which is renewed every 5 years. One-time expenses, not to exceed $2,500 over the cycle of the CAP, 5 years. Life of the waiver limit of $5,000 per beneficiary. Home Accessibility and Adaptation/Home Modifications Included in a combined home and vehicle modification budget of $28,000 per beneficiary per the cycle of the CAP, which is renewed every 5 years. (Appendix B) Home modifications are limited to expenditures of $50,000 of supports (ATES, Home Modifications) over the duration of the waiver, 5 years. Vehicle Modification Included in a combined home and vehicle modification budget of $28,000 per beneficiary per the cycle of the CAP, which is renewed every 5 years. Community Networking Payment for attendance at classes and conferences cannot exceed $1,000 per beneficiary per plan year. Crisis Services Crisis Intervention and stabilization Supports may be authorized for periods of up to 14 calendar day increments per event. Out-of-home Crisis services may be authorized in increments of up to 30 calendar days. For adult beneficiaries who receive residential supports, no more than 40 hours per week for any combination of community networking, day supports and supported employment services. For child beneficiaries who receive residential supports, during the school year, no more than 20 hours per week for any combination of community networking, day supports and supported employment services. See NC Division of Medical Assistance, Clinical Coverage Policy No: 3K-1, Amended Date: March 1, 2018. The CAP/C waiver was renewed by CMS effective March 1, 2017-February 28, 2022. See NC Division of Medical Assistance, Clinical Coverage Policy No: 8-P, Amended Date: November 1, 2016. The Merger of the MCOs! State health officials announced today that the state- and Medicaid-funded Local Management Entities/Managed Care Organizations providing mental health, intellectual and developmental disability and substance use services to North Carolina citizens will be consolidating into four service regions across the state. Further consolidation will improve quality of services, accessibility, accountability and long-term sustainability. Given how long the Medicaid reform discussions have been going on at the legislature, you may be glazed over by now. Give me the memo when they pass something, right? Fair enough, let’s keep it brief. Where do things stand right now? Last Wednesday, the Senate staked out its position in the ongoing debate between the House and the McCrory administration. The Senate’s newest proposal is an unusual mix of different systems and new ideas. Not willing to commit to one model for the whole Medicaid program, the latest version of the bill includes something new called Provider Led Entities, or “PLEs.” PLEs are yet the latest in the alphabet soup of different alternatives to straight fee-for-service billing for Medicare/Medicaid. You’ve all heard of HMOs, PPOs, MCOs, and ACOs. PLEs appear to be similar to ACOs, but perhaps for political reasons the Senate bill sponsors saw the need to call the idea something different. See Knicole Emanuel’s blog. In any event, as the name suggests, such organizations would be provider-led and would be operated through a capitated system for managing the costs of the Medicaid program. The Senate bill would result in up to twelve PLEs being awarded contracts on a regional basis. PLEs are not the only addition to the Medicaid alphabet soup that the Senate is proposing in its version of HB 372. The Senate has also renewed its interest in taking Medicaid out of the hands of the N.C. Department of Health and Human Services entirely and creating a new state agency, the Department of Medicaid (“DOM”). The Senate also proposes creating a Joint Legislative Oversight Committee on Medicaid (“LOC on Medicaid”). But creating the DOM and using new PLEs to handle the provision of Medicaid services is not the whole story. Perhaps unwilling to jump entirely into a new delivery system managed by a wholly new state agency, the Senate bill would keep LME/MCOs for mental health services in place for at least another five years. Private contractor MCOs would also operate alongside the PLEs. The North Carolina Medicaid Choice coalition, a group which represents commercial MCOs in connection with the Medicaid reform process, is pleased. One very interesting item that the Senate has included in its proposed legislation is the following requirement: “Small providers shall have an equal opportunity to participate in the provider networks established by commercial insurers and PLEs, and commercial insurers and PLEs shall apply economic and quality standards equally regardless of provider size or ownership.” You can thank Senator Joel Ford of Mecklenburg County for having sponsored this amendment to the Senate version of House Bill 372. By pulling the Medicaid reform proposal out of the budget bill, the matter appears headed for further negotiation between the House and the Senate to see if the two can agree this year, unlike last year. By legislative standards, that counts as forward progress… Here come the legislative discussion committees to hash it out more between the two chambers. We will keep a close eye on the proposals as they continue to evolve. I have to say…I love it when I am right! In North Carolina, we set up managed care organizations (MCOs) to manage behavioral health care for Medicaid. For the past year, I have been blogging that the MCOs’ payment arrangement with the Department of Health and Human Services (DHHS) is fishy. These MCOs are pre-paid. Their profit hinges on spending less. In order to spend less, the MCOs deny medically necessary services (usually the most expensive) and terminate quality health care providers’ Medicaid contracts. I mean, come on, why authorize more services and contract with more providers if doing so would directly decrease your profit? Apparently, I am not the only person concerned with how the MCOs are compensated. On October 24, 2013, the Centers for Medicare and Medicaid Services (CMS), which is the federal agency charged with overseeing Medicare and Medicaid (as in, if CMS says jump and you accept federal money for Medicaid, you jump) sent correspondence to our Acting Medicaid Director Sandy Terrell. (Remember Carol Steckel abruptly left our Director position, leaving Terrell holding the conch…I bet that conch is getting mighty heavy!). So what? Who cares if the arrangement between the MCOs and DHHS is classified as a subgrant subject to A-87? Blah…blah….blah….right? If the MCOs are subject to A-87, then the use of Medicaid funds is limited to “allowable costs.” Why is that important? Allowable costs do NOT include…. PROFIT!!!!! and other increments above cost. For a rant and rave about the MCOs’ profit, high salaries and expensive health care benefits, see my blog: “NC Taxpayers Demand Accountability as to Behavioral Health Care Medicaid Funds (And That Medicaid Recipients Reap the Benefit of Such Funds). If you take away the ability for the MCOs to profit off of our taxpayers’ Medicaid money, then you take away the monetary incentive for the MCOs to deny medically necessary services and to terminate provider contracts. Know what else you take away? The desire to be an MCO. So what happens now? Just because CMS wrote a letter to NC saying it does not agree with our payment arrangement with the MCOs, does that mean that we have to immediately stop and desist from paying the MCOs? No. 2. Comply with A-87 by changing the payment methodology and reimburse only for the cost of services actually rendered plus administration costs. I am actually doing the Snoopy dance as you read this. Herein lies the problem…How many times in the last 10 years, has NC changed the mental health care system? How many mess-ups? How many Medicaid recipients have not received medically necessary mental health care service because of NC changing the mental health system over and over? Just like Eva Peron, NC had full faith the MCOs, enacted them statewide, and, then, not even a year into the statewide MCO progam…BOOM! The MCOs are married with kids. So what DOES happen now? If, on the other hand, CMS demands change, in the long-term, there will be great change. If we go with Door #1…”Openly procuring behavioral health services and making the counties compete on the same basis as with any other commercial entity,” what will that look like? I believe CMS is envisioning not allowing the MCOs to monopolize their catchment areas. And more mergers are currently being contemplated. But, for now, if you live in Mecklenburg county and need behavioral health care services you must go through MeckLINK. Raleigh? Alliance is your MCO. You have no choice of MCOs and must use a provider within the MCO’s catchment area. For this option, I believe, that the MCOs could remain where they are, but contract to be paid some, sort of, “cost-plus.” No more…if you do not spend it, it is your profit. Theoretically if the money were not spent, it would be returned to DHHS, or, somehow, kept for additional services. Bye, bye, monetary incentive to deny services and terminate providers! No matter which door NC chooses, it has to be better than our current situation with the MCOs. Ok, I stopped doing the Snoopy dance. Because, in reality, there will be change. We do not know what the changes will be. And, dag on it, change is scary, especially we are talking about changes to mental health services for Medicaid recipients. DHHS’ Robotic Certification of MCOs…So Stepford-ish! In order to comply with the statute, Secretary Wos conducted the first certification and published the findings July 31, 2013. Well, actually Carol Steckel signed the certification and sent it to Sec. Wos (technically Wos did not conduct the certification, but she certified the content). Attest means to provide or service as clear evidence of. See Google. Clear evidence? That the MCOs are compliant? One of the areas that was certified was that the MCOs are timely paying providers, that the MCOs are accurately processing claims, and that the MCOs are financially accurate (whatever that means). Wow. Who would have guessed that East Carolina Behavioral Healthcare (ECBH) is 100% compliant as to timely payments to providers, 100% compliant as to accuracy of claim processing, and 100% compliant as to financial accuracy. ONE HUNDRED PERCENT!! As in, zero noncompliance!! I mean…Wow! Wow! Wow! Wow! Wow! Have you ever read “The Stepford Wives?” The book was published in 1972 by Ira Levine. Basically, the main character, Joanna Eberhart and her husband move to Stepford, Connecticut (a fictional place). Upon arrival, Joanna and spouse (I can’t remember his name, so we will call him Ed) notice that all the woman are gorgeous, the homes are immaculate, and the woman are all perfectly submissive to their husbands (how boring would that be??). As time passes, Joanna becomes suspicious of the zombie-like actions of all the wives. She and her friend Bobbie (until Bobbie turns zombie-like) research the past of the Stepford citizens and discover that most of the wives were past, successful business women and feminists, yet become zombie-like. At one point, they even write to the EPA inquiring as to possible contamination in Stepford. After Bobbie turns zombie-like, Joanna fears that the women are changed into robots. She decides to flee Stepford, but is caught and is changed into a robot. The books concludes with Joanna happily and submissively walking the grocery store with a large smile and robotic movements, and another wife moving into Stepford. That book coined the word “Stepford” to mean someone acting as a robot, submissive, or blissfully following orders. I am not saying that the DMA certification was conducted as a Stepword wife…I am merely explaining that I was reminded of “The Stepford Wives” when I read the certification. Maybe there is no analogy to be made…you decide. Upon quick review of the certification, a number of questions arise in my mind. Such as…didn’t anyone proofread this??? 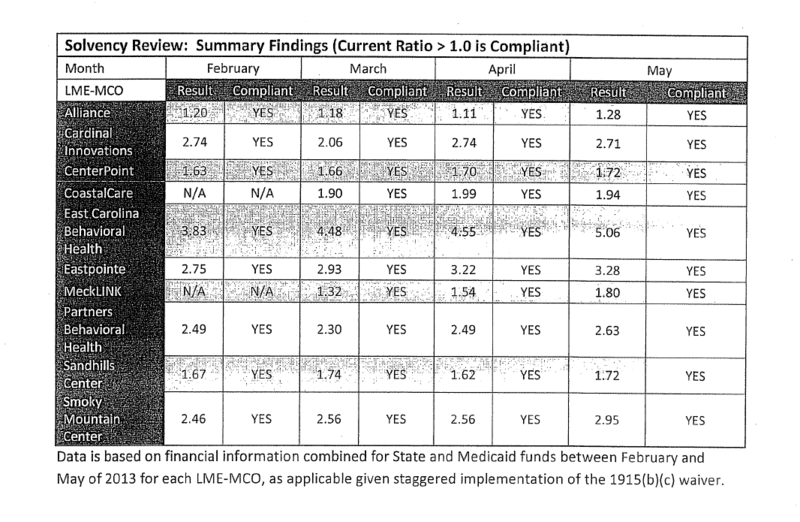 Under each graph, it states “Data is based on a statistical sample of Medicaid claims processed between February and May of 2013 for each LME-MCO.” Data is??? Hello!…It is data ARE, not data is!! Data are; datum is. Besides the obvious grammar issue, I am concerned with the actual substance of the certification. Nothing is defined. (Not surprising for an entity that doesn’t know data are plural). Except “compliant” is defined on the last page as “A finding of “compliant” means that HMS found that the LME-MCO was compliant with the requirements set forth in SB 208.” That is like saying, “Beautiful is hereby defined as whatever I say is beautiful.” That is not a definition. And HMS? 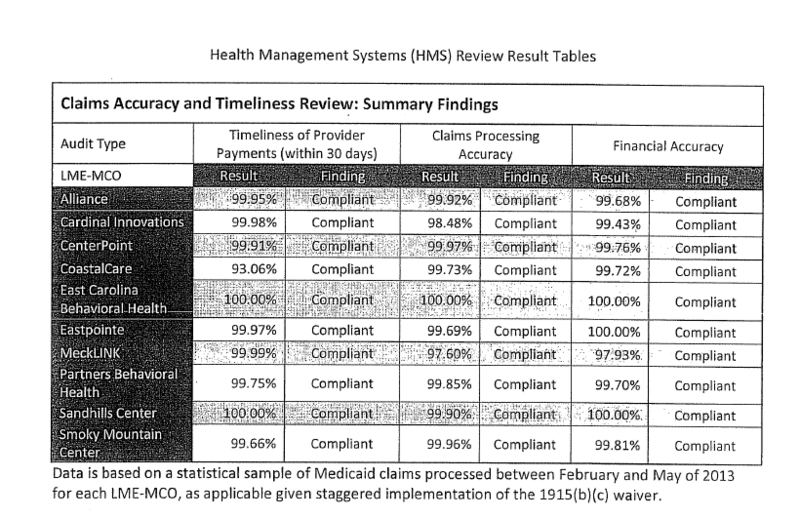 HMS, as in, the company North Carolina hired as a Medicaid recovery audit contractor (RAC)? I do not know if HMS the RAC and HMS the credentialing company is the same company…but the names sure are similar. Speaking of RACs, going back to the basis of the data…”a statistical sample?” (Which is not defined?) What is a statistical sample? Is this a statistical sample like Public Consulting Group’s (PCG) in extrapolation audits? From where does the sample come? Looking at the timeliness of provider payments, the lowest percentage is CoastalCare. At 93.06%. But what does that mean? That CoastalCare takes longer than 30 days to pay providers in 6.94% of cases? And what is noncompliance? 80%? 20%? Because where I went to school, a 93% is a ‘B.’ Yet 93%, here, is “compliant.” Does “compliant” mean not failing? What is “claims processing accuracy?” Does that mean that ECBH was 100% correct in processing (or not processing) claims based on medical necessity (or failure to meet medical necessity)? or, merely, that the process by which ECBH processes claims (regardless of whether the process abides by clinical policy), does not deviate; therefore ECBH is 100% compliant? How does one determine 100% compliance? Does this certification mean that between February and May 2013, Sandhills paid 100% providers timely. That for 4 months, Sandhills was not late for even one provider? Because Sandhills had 100% in relation to timely provider payments. (Personally, I would be extremely hesitant to attest for any entity achieving 100% compliance. How easy would that be to disprove?? A journalist finds one mistake and the certification loses all credibility). The next chart demonstrates the MCO’s solvency. I have to admit…this chart makes very little sense to me. The only information we get is that greater than 1.0 equals compliance. If you ask me, being greater than 1 seems like a very low bar. But, if greater than 1 equals compliance, then, applying Logic 101, the higher the number the more solvent. I could be wrong, but this makes sense to me. Using that logic, in February MeckLINK was N/A (not “live” yet). March: 1.32. April: 1.54. May: 1.80. Tell if I’m wrong, folks, but it appears to me that MeckLINK, according to HMS and unknown data, that MeckLINK is becoming more solvent as the months pass. And this is the same MCO that WFAE cited was using accounting tricks to remain in the black???? Under the chart demonstrating the “Solvency Review,” it states, “Data is (sic) base don financial information…” Duh!! I thought we’d review employee personnel records to determine solvency!! (Although…that could be helpful because we could see employee salaries…I’m just saying…). What the certification does not say is financial information from whom? The MCOs? Going back to the finding of compliance means HMS determined compliance…Does that mean that HMS compiled all the data? What about the intradepartmental monitoring team? Does the intradepartmental monitoring team just authorize whatever HMS says it finds? Almost…Stepford-like. The letter from Steckel showing DMA’s attestation of all 10 MCOs being appropriate for certification says just that…DMA is attesting that all 10 MCOs are appropriate for certification. No analysis. No individual thinking. Almost…Stepford-like. Again, no analysis. No independent thinking. 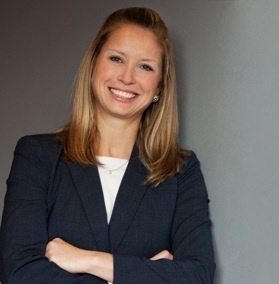 Steckel’s letter is dated July 31, 2013; Sec. Wos’ letter is dated July 31, 2013. Wos did not even take ONE DAY to verify Steckel’s letter. What good is a statute requiring DHHS to certify the MCOs every 6 months if each certification is attested to by a Stepford?? The “Single State Agency” Medicaid Requirement: The Buck Stops With Whom????? What is THE most important law? I’m sure most people would have a differing opinion. Maybe you think the most important law is that it is against the law to murder a person. Or to not drive drunk. Personally, I think the most important law of the United States begins, “We the People of the United States, in Order to form a more perfect Union, establish Justice, insure domestic Tranquility, provide for the common defence, promote the general Welfare, and secure the Blessings of Liberty to ourselves and our Posterity, do ordain and establish this Constitution for the United States of America.” The Constitution of the United States. Well, in the Medicaid arena, in my opinion, the most important law is the “single state entity” requirement. Why is the “single state entity” requirement so important? Have any of you tried to read Title XIX of the Social Security Act? Or the 1915(b)(c) Innovations Waiver? The State Plan? If you have, then you know how difficult Medicaid laws, rules and regulations are to read, much less understand. It’s a bit like reading Chaucer in its original language, Middle English, in kindergarten…not impossible, you can sound out all the words…but, in the end, you have no idea what it was you just read. Wife of whom? What if we allowed 10 different companies, each with different employees, to implement/interpret Medicaid laws, rules, and regulations? Each of the 10 companies would read the Medicaid laws, rules and regulations differently. We would not have a statewide consistent Medicaid system. Medicaid is tough enough, we, at least, need one agency to implement and interpret all of Medicaid. Another example is if, suddenly, we had no president or federal government. And all 50 states’ governors tried to run the country, as a country and not 50 independent states. We would, obviously, have 50 different “leaders” trying to run one country with 50 different ideas as to how the country should be run. There would be no nationwide uniformity. Hence, the “single state agency” requirement. DHHS must implement/administer/interpret all Medicaid decision for the sake of uniformity. Not only is the “single state agency” requirement logical, it is federal law. 42 U.S.C. 1396 a(a)(5) requires states participating in the Medicaid program to designate a “single state entity” to operate the Medicaid program. In North Carolina, that “single state entity” is the Department of Health and Human Services (DHHS). Remember the sign on Harry Truman’s desk? “The Buck Stops Here!” Meaning, as a president, President Truman understood that anything that went wrong in any federal department was on his shoulders. He was the captain of the ship. He was the big cheese. The buck stopped with Truman. In NC Medicaid, the buck stops with DHHS. According to federal law, the “single state entity” may contract with entities, such as Managed Care Organizations (MCOs), Recovery Audit Contractors (RACs), etc. to assist with certain functions of the Medicaid program. But…that “single state entity” CANNOT delegate its authority to “issue policies, rules, and regulations on program matters.” 42 C.F.R. 431.10. “If other State or local agencies or offices perform services for the Medicaid agency, they must not have the authority to change or disapprove any administrative decision of that agency, or otherwise substitute their judgment for that of the Medicaid agency with respect to the application of policies, rules, and regulations issued by the Medicaid agency. 42 C.F.R. § 431.10(e)(3).” (emphasis added). Then how can an MCO determine that a provider’s Medicaid contract should be terminated without DHHS’ authorization (which, I believe, is a substitute of judgment in applying policies)? How can an MCO determine that a Medicaid recipient’s services should be reduced (another substitution of judgment in applying policies) without DHHS’ authorization? If you ask me, the MCOs cannot terminate a provider’s Medicaid contract or reduce services without DHHS’ authorization. Substituting an MCO’s judgment in applying Medicaid policies is a violation of the “single state entity” requirement. Yet….the MCOs are doing just that. Currently DMA is reviewing LME-MCO contract terminations and service denials when appealed due to LME-MCO manuals stating that appeals of denials should come to DMA prior to Office of Administrative Hearings (OAH). DMA should not be a part of the LME-MCO appeals process. We ask that you please correct your manuals by August 7, 2013, and share with your contract managers so that these appeals can be appropriately routed. Yes, I agree, the author could have written this Communication Bulletin is a way that would have been easier to read. But, maybe that is the point. Right now, the MCO manuals instruct MCOs to send DMA all contract terminations and service denials prior to going to the OAH (litigation). But, DMA does not want to be a part of the appeal process anymore. Therefore, revise all MCO manuals to reflect that MCOs no longer need to send DMA contract terminations and service denials, even if those denials and terminations are appealed. I also infer from this language that, since the inception of MCOs, DMA has not reviewed any contract terminations or service denials unless these denials and terminations are appealed. And then, even scarier, Bulletin #55 seems to say that DMA wants to be involved even LESS. In essence, we have 10 MCOs, 10 jurisdictions, 10 interpretations of Medicaid laws, rules and regulations. And no statewide uniformity. That is a lot of bucks. This tip, Tip #6, is devoted to Outpatient Behavioral Health providers. Outpatient Behavioral Health providers are licensed psychologists or psychologists who provide mental health counseling to Medicaid recipients.In light of the recent mass murder in Connecticut, I believe that most people would agree that the ability for anyone to receive mental health services is of utmost importance. In my opinion, mental health services are the most needed and most under-used health care service. In the debate between guns and violent video games, I say that mental health issues and mental health care services trump both. Create a society in which mental illnesses are (not necessarily accepted) but not stigmatized, people are comfortable asking for help regarding mental illnesses, people can identify others who are in need of counseling, and all people, no matter their insurance coverage, have access to mental health care services. Create this society and this society equals violent crimes under control. A society in which a gun is merely a gun. For hunting, protection of family, or sport…not a weapon of mass destruction. Mental health awareness is the key. Ok, enough of my soap box. In North Carolina, Outpatient Behavioral Health providers are bound by NC DMA Clinical Coverage Policy No. 8C. Policy No. 8C is much shorter in length than most clinical policies. It’s terseness is a thing of beauty for the Outpatient Behavioral Health providers. Because 8C is so short, so terse, all Outpatient Behavioral Health providers should print off Policy No. 8C and fasten it onto the walls of the office (at least the meaty portions…not the beginning and ending fluff). Outpatient Behavioral Health providers should have Policy 8C memorized. Outpatient Behavioral Health providers should dream about Policy 8C. Outpatient Behavioral Health providers should be able to regurgitate the meat of Policy 8C …..I mean, come on, people, Policy 8C is 31 pages. Without the fluff (just the meat) Policy 8C is only, in my opinion, 10 pages of meat…10 pages (pages 7-17)!!!! If the Outpatient Behavioral Health providers memorize a mere 10 pages, the Outpatient Behavioral Health providers will be able to thwart potential reconsideration reviews. Even if the State threatens or begins a reconsideration review, if the Outpatient Behavioral Health providers have memorized these 10 meaty pages, the Outpatient Behavioral Health providers will easily be able to defend the reconsideration review based on documentation and, thus, avoid any alleged overpayments. (After page 17 is important to follow in practice: it consists of billing codes and revisions to past policies, but 17-31 is not the “meat” regulating Outpatient Behavioral Health providers). For this blog, I am concentrating on Section 7.3.3. Section 7.3.3 is, by far, the biggest reason Outpatient Behavioral Health providers get dinged in Medicaid audits….BY FAR. Service notes….really? YES. Service notes are detail-oriented. Tedious. And one mistake on a service note…I mean a SMALL mistake…will cause the State to attempt to recoup the Medicaid payment bestowed for the entire service rendered. For example, an Outpatient Behavioral Health provider gets prior authorization from the correct state-contracted entity , a valid referral by a Carolina ACCESS primary care physician, a signed consent by the Medicaid recipient, a regulatory-correct Comprehension Clinical Assessment, a valid Treatment Plan and Service Plan… BUT….on the service note for one day…one couseling session….forgets to describe the Medicaid recipient’s reaction to the counseling. Or forgets to put the duration of the session (writes 6pm, but forgets to write that the session ended at 7pm). Or forgets to describe the nonverbal journal-writing session and bills for the play treatment (a higher-reimbursable code). What happens? A Medicaid audit. Signature, with credentials, degree, and licensure of clinician who provided the service. Electronic signatures must adhere to DMA guidelines. A handwritten note requires a handwritten signature; however, the credentials, degree, and licensure may be typed, printed, or stamped. Service notes must be written in such a way that there is substance, efficacy, and value. Interventions, treatment, and supports must all address the goal(s) listed in the plan. They must be written in a meaningful way so that the notes collectively outline the beneficiary’s response to treatment, interventions, and supports in a sequential, logical, and easy-to-follow manner over the course of service. Is this difficult? No. Not rocket science. I suggest creating a template. The template should have a space for every required component of the service note. Print off hundreds…no thousands. Keep the print-offs in a location that all employees, if present, know of and make them understand that every service note must adhere to the template. Completely. No short-cuts. No…”I forgot.” Follow the template. Wow. Shock and awe. Could that happen? Yes: MEMORIZE THE MEATY 10 PAGES OF POLICY 8C!!!!! And you too could avoid Medicaid recoupments.